Chadian rebels’ lightning strike on the capital N’Djamena in late January and early February is the latest and most dramatic consequence of two combustible situations that remain on collision course. The first is the continuing tragedy in neighboring Darfur and the government of Sudan’s support for Chadian rebel groups to topple the Chadian President Idriss Deby. Deby supports the deployment of a European Union peacekeeping force to Chad and the Central African Republic, and his government backs some of the Sudanese rebel groups fighting in Darfur. The regime in Khartoum seeks to undermine the EU Force’s deployment and sever Chadian ties to Darfur rebels. (See ENOUGH reports A Race Against Time in Eastern Chad and How to Protect Civilians in Eastern Chad.) As ENOUGH called for in a February 11 joint statement with the Save Darfur Coalition and Genocide Intervention Network, the United Nations Security Council must respond with targeted sanctions against senior Sudanese officials responsible for supporting the overthrow of a neighboring sovereign government. Further, the international community must radically step up efforts to deploy the joint UN/African Union mission to Darfur and the EU mission in Chad. The second combustible situation is the political crisis inside Chad. Despite the Chadian government’s assertions that all of Chad’s problems emanate from Sudan’s capital Khartoum, Chad’s government is among the world’s most venal and its citizens are among the world’s most destitute and disenfranchised. Chad provides an accommodating theater for regional conflict and proxy war because it is grappling with its own very serious internal crisis. In the wake of the most recent coup attempt, the Chadian government has cracked down hard on unarmed political opposition. Opposition leaders have been arrested, fled to neighboring countries, or been driven underground. To Chadians seeking a peaceful way forward, the international community’s silence has been deafening. Indeed, for the enormous danger that this political crisis poses—to international efforts to halt violence in Darfur, to long-term regional stability, and to civilians ensnared by warfare—the world is remarkably ill-equipped to address it. Put bluntly, the international community has at present neither the resources nor the inclination to press for a comprehensive approach to Chad’s internal crisis—a necessary component to arrest a slide into chronic regional warfare. Specifically, the EU and AU should lead a process to reconcile the warring factions inside Chad and pressing for internal political reforms that will mitigate future conflict. France, the United States, and China should work together to provide the leverage necessary to achieve genuine reform. As in Sudan, all three nations would benefit from peace and stability in Chad, yet none individually has enough leverage to accomplish this difficult task. The French have considerable influence, but Paris is not viewed as a neutral broker because of its colonial baggage and unwavering support for President Deby. China’s influence with Chad is expanding rapidly due to its growing commercial ties. The United States is developing a closer counterterrorism alliance with Chad and, like Paris though to a lesser degree, Washington is far from neutral. Absent a dramatic re-alignment of policy priorities and an equally significant injection of diplomatic capital, the United States and its potential partners will remain totally irrelevant to ending Chad’s internal conflict and pressing for political reforms that could mitigate future conflict in Chad and in the region. The United States is pursuing two important foreign policy objectives in Chad: counterterrorism and the delivery of humanitarian assistance. The Bush administration deserves strong praise for helping to sustain a massive humanitarian operation in eastern Chad (and in Darfur), but humanitarian assistance does not resolve conflict or prevent atrocities. While U.S. policymakers might agree with the importance of supporting conflict resolution, political reform, and social and economic development—three critical components of preventing crimes against humanity—the simple fact is that the United States is not putting any meaningful resources behind these goals. Chad sits in the Sahel, the vast land bridge between the arid Maghreb region of North Africa and tropical West and Central Africa. This is a region of burgeoning interest to U.S. counterterrorism officials. The Bush administration is justifiably concerned that the porous borders and loosely governed northern reaches of Sahelian states offer tempting sanctuary for extremist groups. Accordingly, Chad is one of several countries receiving U.S. assistance through a program called the Trans-Saharan Counterterrorism Partnership. U.S. officials describe the program as a mixture of military training, development assistance, and good governance promotion. However, in Chad, as in other states in the Sahel, the United States is channeling most of its resources toward military training while neglecting the equally important task of addressing the social and economic circumstances that fuel internal conflict and extremist ideologies. “Democracy, good governance, internal political dialogue…of course we support all of those things,” a U.S. Embassy official in N’Djamena told ENOUGH. “But the reality is that we don’t have the resources to make a serious impact.” Last year, the Bush administration requested a paltry $200,000 in development assistance for Chad—and that money was allocated to help train Chad’s military. And while Navy SEAL teams train Chadian army units in basic infantry tactics, the U.S. Agency for International Development, or USAID, does not even have an office in N’Djamena. For impoverished, disenfranchised, and conflict-weary Chadians, U.S. priorities are not difficult to discern. The United States may not devote the diplomatic or economic resources to be a serious player in helping to end the cycle of violence in Chad, but Washington is not without influence. President Deby wants U.S. friendship and is willing to make some sacrifices to get it. By allowing U.S. Special Forces to work in northwestern Chad, Deby almost certainly put himself on sour terms with his unpredictable and powerful neighbor, Muammar al-Gaddafi of Libya. Even with the recent rapprochement between Washington and Tripoli, Gaddafi bristles at the notion of international forces roaming around his traditional domain of influence. At the same time, Deby is well aware of his counterterrorism value. If he were to back out of his relationship with the United States (which is unlikely) it would be a setback in the Pentagon’s plans to more closely monitor the northern Sahel. In 2004 in northeastern Chad, Chadian and Nigerien forces—with on-the-ground support from U.S. Special Forces assisted by satellite intelligence—fought a fierce gun battle with Islamic militants from the Algeria-based Salafist Group for Preaching and Combat, or GSPC. The eventual capture inside Chad of the group’s number two, Amari Saifi, also known as Al Para, was touted as a major counterterrorism success. Tension interspersed with bloodletting has been the norm in eastern Chad for the past four years, and policymakers most often view the crisis in eastern Chad through a Darfur lens. Consequently, conflict resolution efforts have thus far focused principally on the tensions between N’Djamena and Khartoum. That is only part of the story. Though fuelled by weapons and support from an external patron, the rebellion in Chad is the latest chapter in a decades-long internal power struggle. Chadian politics for the last 40 years has been a high-stakes game of “King of the Hill” in which politics and armed conflict are synonymous. Warrior politics in Chad mirror the factionalism of Chadian society, which is divided on ethnic and geographic lines. The faction in power has traditionally used the presidency as an instrument to loot the country, and Chad’s growing oil revenues have raised the stakes to new heights. Rebel groups frequently turn to outside patrons to accomplish regime change. Chadian officials blame Islamists in Khartoum for the current crisis in the East, but Deby’s own government came to power in 1990 with Khartoum’s backing. With or without Sudanese or other external meddling, the roots of conflict in Chad are internal. Conflict-based politics has manifested itself in successive thuggish and venal presidents: Chad ranks 172 out of 179 countries on Transparency International’s Corruption Performance Index. On the U.N.’s Human Development Index, a comprehensive measure of human development, Chad ranked 170 out of 177 countries, and it ranked dead last on the human poverty index. On Foreign Policy magazine’s Failed States Index, Chad ranks fifth, right behind Zimbabwe (where inflation has reached an unfathomable 66,000 percent) and Somalia (a country without a functioning central government). Conflict and warlordism will continue in this desperate and militarized nation until Chadian opposition groups see alternatives to violent overthrow of the regime in charge. The United States faces a critical policy choice in Chad and would be well-served by a long-term perspective focused on domestic political reform. This long-term approach must be pursued in tandem with short-term steps to halt the violence and end Khartoum’s campaign to destabilize its fragile western neighbor. None of our policy priorities—preventing the spread of terrorism, promoting stability and democracy, or alleviating human suffering—can be effectively pursued unless and until we shift from crisis management on the cheap to crisis prevention backed by the resources required. The existing U.S. counterterrorism program may prevent individual terrorists from exploiting Chad’s open spaces, but it will not thwart the potential rise of extremism, unless and until we invest development resources in building the institutions that can put Chad on a democratic path. Stability in Chad cannot be secured by simply backing an ally in the war on terrorism, any more than it can be secured in Pakistan through our support for its government. Democracy will not emerge without an investment in conflict resolution, and human suffering will only grow unless and until we tackle both Chad’s internal conflict and its development deficit. Brokering a ceasefire: In the past, the international community has ceded mediation between the Chadian government and armed opposition to Libya, which acted independently and with negligible results. Al-Gaddafi strives to maintain influence over Chad’s affairs, opposes the deployment of U.N. and EU forces to protect civilians, and has at times supported rebel groups on all sides of the conflicts in Darfur and Chad. This time, the AU has asked al-Gaddafi and Republic of Congo President Denis Sassou-Nguesso to mediate between President Deby and the rebels. It is critical to start this process on the right foot by taking steps to include other actors—particularly the United States, EU, France, China, and the United Nations—in efforts to secure a ceasefire. The State Department should send additional political officers to N’Djamena to support this initiative and base a full-time diplomat in eastern Chad. The EU, France, China, and the United Nations should also devote more diplomatic resources. Protecting civilians and monitoring a ceasefire: The European led force, which resumed deployment on February 12, must reach full capacity quickly to protect civilians in eastern Chad who are still highly vulnerable to cross-border attacks and inter-communal violence inside Chad. The U.N. Security Council authorized the EU force, called EUFOR, last year, along with a U.N.-led mission, called MINURCAT, to train Chadian police to protect Sudanese refugees and Chadians displaced by the violence. The mission’s credibility as a civilian protection mission hinges on its neutrality, particularly in light of the heavy involvement of the French military in EUFOR. EUFOR and MINURCAT must make every effort to protect all civilians and humanitarians from any perpetrator of violence. As deployment presses ahead, the United States, France, and China should immediately begin consultations within the Security Council and with the EU to revise EUFOR’s mandate to include monitoring an eventual ceasefire. Punitive action against Khartoum: Khartoum will remain a menace to Chad and the region until the rest of the world makes the cost of doing so too steep. 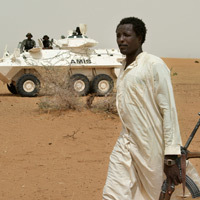 The United States, France, and the UK should work with China and Russia to introduce immediately a U.N. Security Council resolution authorizing targeted sanctions on senior Sudanese officials responsible for supporting the overthrow of a neighboring sovereign government, for obstructing the deployment of international protection forces in Chad and Darfur, and for continuing to promote violence in Darfur. Negotiations on serious political reform: The international community must quickly build on a ceasefire by pressing for genuine political dialogue between the Chadian government and opposition groups—armed and unarmed. Right now, the EU is supporting political dialogue between the government and unarmed political opposition. Although those talks have yielded some minor breakthroughs, such as a basic agreement on steps to reinforce democratic institutions, Deby’s recent moves to suppress non-violent political opposition threaten to scuttle this process. Moreover, the talks lack the consistent high-level diplomatic engagement that would yield results. Conflict-based politics are the root cause of the crisis in Chad, and the international community must press for radical political reform to break this cycle. The first step must address the criminalization of dissent in Chad and the recent arrests and intimidation of political opposition leaders and activists. The attack on N’Djamena demonstrates in stark terms that the political dispensation in Chad is untenable. Having supported Deby (albeit limply) during the coup attempt, the U.N. Security Council should now demand that his government cease harassing opposition leaders and release political dissidents. France, the United States, China, and the EU must also use their leverage and press Deby to resist the knee-jerk heavy-handedness that threatens to plunge Chad deeper into crisis. The EU-led process should be expanded to include all opposition and civil society groups, including armed groups currently fighting in the East. The first objective should be for armed groups to transition themselves into unarmed political parties, with appropriate security guarantees from President Deby. Political negotiations should not focus on doling out ministries to rebel leaders and political strongmen, but genuine political reform and laying a foundation for free-and-fair elections. The United States should work with the EU, AU, France, Libya, and other regional states to broaden the political process, and urge China to support political reform. Such reforms should include a new constitution with a bicameral legislature (two chambers) that gives space for Chad’s many factions—political, ethnic, and geographic—to have a greater say in the critical issues facing the country. A more aggressive development agenda: While political leaders negotiate the way forward for the Chadian government, Chadian citizens deal with grinding poverty, endemic government corruption, and non-functioning social services. The United States must quickly address the shortcomings in its foreign assistance program by establishing a permanent USAID office in N’Djamena to coordinate with other donors and the U.N. on initiatives to provide humanitarian assistance, relieve poverty, improve governance, and build Chadian state capacity to provide basic social services. The donor community should increase available funding but also must hold the notoriously corrupt Chadian government to account by conditioning all foreign assistance—excepting humanitarian aid but including military and counterterrorism assistance—on greater fiscal transparency. So, is anyone serious about ending the political crisis in Chad? The answer right now is “no”: the United States, France, the EU and the AU are all guilty of putting band-aids over gaping wounds, and China remains unswerving in its stated policy of non-interference with internal politics. To help end the cycle of conflict and begin to stabilize the region, the international community needs to get serious about peacemaking in Chad. A failure to do so condemns Chadians to a continuing cycle of conflict and poverty, increasing the likelihood that crimes against humanity will continue to wrack the region. Colin traveled to Chad three times in 2007, most recently in December. For a discussion of similar U.S. policies in neighboring Niger, see “Foreign Assistance Follies in Niger,” by Colin Thomas-Jensen and Maggie Fick, CSIS Online Africa Policy Forum, September 2007. The GSPC has since changed its name to Al Qaeda in the Islamic Maghreb, or AQIM, and has carried out devastating strikes in Morocco and Algeria. El Para was captured by Chadian rebels operating in northwestern Chad and handed over to the Libyan government. The French government took the lead within the EU and the U.N. Security Council to approve and authorize a mission to protect civilians and will contribute about 1350 of EUFOR’s 3500 personnel. At the same time, France remains President Deby’s steadfast ally. The 1200 French troops stationed in Chad as part of Operation Epervier (“Operation Sparrowhawk”) have provided valuable logistical and intelligence support to the Chadian army’s operations against rebel groups; up to 500 of those same troops will form the early backbone of EUFOR. · To contribute to protecting United Nations personnel, facilities, installations, and equipment and to ensuring the freedom of movement of its staff and United Nations and associated personnel.